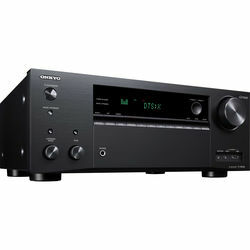 A/V receivers improve the sound quality of home theater speakers and the picture quality of TVs. They amplify audio signals and channel them to surround speakers and subwoofers. These devices have multiple input and output ports for analog and digital audio and video signals. You can find built-in AM/FM radio tuners on some, with high-end models capable of streaming internet radio channels. A/V receivers process audio and video signals from multiple sources in order to drive speakers and displays respectively. They accept input signals from a wide range of consumer electronics, including satellite, cable, and streaming boxes, as well as gaming consoles and DVD and Blu-ray players. Home theater receivers display processed videos from these sources on TVs, computer monitors, and projectors. Why Use a Home Theater A/V Receiver? Improved sound quality and multimedia integration are the two key reasons to get one of these devices. An A/V receiver ties together all the entertainment electronics in the home so you can control sound and video outputs from one appliance. It amplifies and decodes sound signals and delivers better audio quality than sound bars and speakers built into TVs. The best home theater receivers also have wireless capability and can drive wireless multi-room speakers. You shouldn't put too much work into comparing audio quality for receivers. Most of them have amplifier power outputs around 100 watts, and there isn't a huge difference in sound quality. More importantly, consider how and where you want to use the device. For example, models with built-in CD players and changers are useful for listening to CDs on home theater systems. If you have a multi-room speaker setup, consider a device with a zone function. Some units have wireless connectivity options and support standards such as Bluetooth and AirPlay. Get one of these if you plan to stream audio from mobile devices. Most home theater receivers have 5.1 and 5.2 channels. This means they can drive five (left, right, center, left surround, and right surround) speakers and one or two subwoofers. There are also 7.1 and 7.2 models with support for left and right rear surround speakers. Receivers with 5.1 channels support surround sound formats such as Dolby True, Dolby Digital Plus, DTS-HD, and DTS-HD Master Audio. Those capable of driving overhead speakers also add support for DTS:X and Dolby Atmos. If you have a 4K TV, you should get an A/V receiver capable of 4K upscaling. This up-converts HD movies to UHD or 4K resolution. Home stereo receivers only have two channels for sound amplification while A/V versions usually have five. This difference makes sound outputs from 5.1 and 7.1 receivers significantly more immersive. A stereo receiver is only suitable for small spaces such as offices and bedrooms, while A/V receivers are optimal for much larger areas. Transform your listening and movie-watching experiences when you connect all your entertainment devices to a home theater receiver. 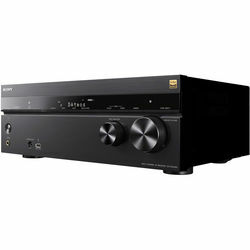 Find a wide selection of premium A/V receivers from reputable audio brands at B&H Photo and Video.